A Florida panther was recently released into the Picayune Strand State Forest — a rare event, in a bid to help save the species. The tagged female will hopefully become a safe and successful mommy! She and her brother were raised from the age of five months at the White Oak Conservation Center in Yulee, rescued after their mother was found dead. 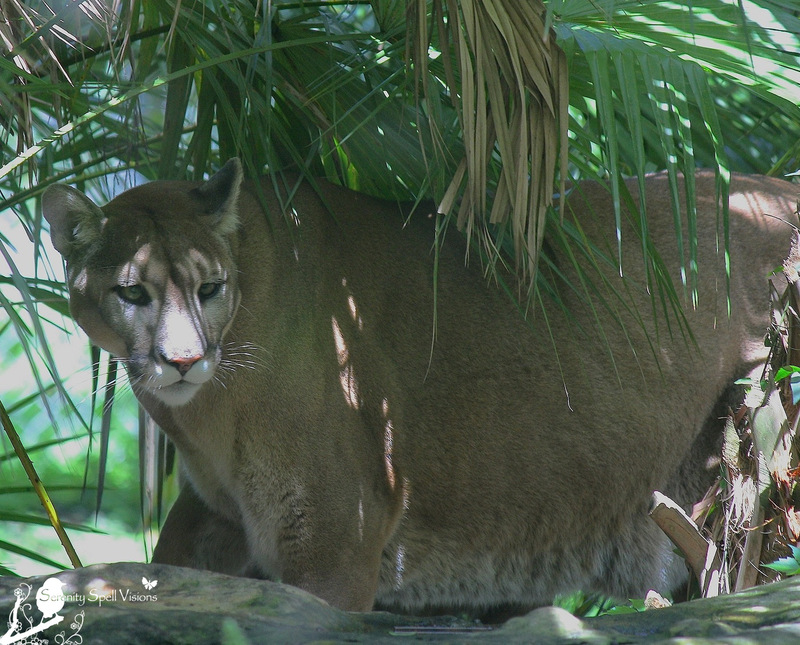 Florida panthers were among the first to go on the Endangered Species List back in 1973 when there were as few as 20 remaining individuals. Today they are still in great peril with as few as 100-160 in the wild, but biologists with the Florida Fish and Wildlife Conservation Commission (FWC) successfully released one female Florida panther into the Picayune Strand State Forest recently with the hope that she will become a successful mom. So much luck to this girl (and to her soon-to-be-released brother!) – AND so many thanks for the continued rescue and conservation efforts the world over! …. Hard to believe that I am in favor of restoring a critter that will gladly EAT ME if it finds me in the wild – but I am. I’m also in favor of eliminating the barbaric practices that we are allowed to do to animals that have no business being held in captivity in the first place. De-clawing? …. This post of yours brings to mind one you did a while back on Cypress Creek – the one where you found the panther paw print. Did you ever turn your sighting in to the F&W people? They want reports of paw sightings so they can track population trends. Very true, all life deserves its place on this planet of ours. And, good idea — I hadn’t reported this sighting, but I will do so immediately…. VERY true, very true!! After her tough start in this life, she got such wonderful help… SO much love to her now! She is, isn’t she? And soon enough, her brother will be as well! The work of these conservationists is just amazing. Thank goodness for them…. Good enlighning post! Such laws are banned in Sweden as well as well as to keep wild rehabilitated animals in captivity. All rehabilitated animals that can’t be realesed into the wild are euthanased! I must say that I support that! We are INCREDIBLY behind-the-times. Our laws are downright PRIMITIVE. De-clawing exotic cats? And you should see the “legal” requirements for enclosures for these animals. It’s BARBARIC. I can’t believe the U.S. allows this, still. Well, it’s state-by-state. And it’s pitiful. So exciting! I hope they are able to cope in the wild since they are rised in captivity (i guess with this purpose). Declawing and small cages sounds like torture to wild animals. I wish her (and her soon-to-be-released brother) so much love and luck out there… From the cars, the people, the elements. And YES: I just mentioned this on another international blogger’s comment: The U.S. is pitifully PRIMITIVE when it comes to these “laws” pertaining to exotic animals. De-clawing? Disgusting. And the size of their permitted enclosures is nothing more than a tiny jail cell. It’s appalling. Wonderful. A release!!! I am glad that you are making public the torture that we inflict on the animal kingdom. There always has to be a better way. Thanks so much… There most DEFINITELY can be better regulations. The U.S. is pitifully PRIMITIVE when it comes to these “laws” pertaining to exotic animals. De-clawing? Disgusting. And the size of their enclosures is nothing more than a tiny jail cell. It’s appalling. We can, and should, be doing MUCH more to help wildlife captive in these people’s possession. My stomach turns as I read of the declawing, of this or any cat. I want to shame people when I hear that their “cat’s been declawed” because he or she was scratching the furniture. Hmmm. Maybe we should cut off the the tips of their fingers to the first knuckle, just to make things even, eh? I’m heartened to hear of one more beautiful species that may survive us. Will human beings ever stop taking the fast lane to conquer all that stands in the way of way they want? There has always been the conquer and destroy mindset and it will be our downfall. Thank you for posting this, both heartbreaking and uplifting! Beautiful cats. I’ve been reading how certain counties in the U.S. (WEST) are now making it illegal to do this de-clawing surgery! Unfortunately it’s county-by-county, though. But overall, we’re seriously behind when it comes to these “laws” pertaining to exotic animals. De-clawing? Disgusting. And the size of their enclosures is nothing more than a tiny jail cell. It’s appalling. We need to do MORE to help these animals and punish the people maiming and torturing them — not HELP them keep the animals in this condition! Thanks so much… At least in these stories, it all ended well, yes? The rescues AND the release, hoorah!! Others have left comments saying what I would say, so I’ll only add another great post, keep them coming! Great post. Hopefully she thrives. Thanks so much…. Sending much love and luck her most beautiful way — and to her soon-to-be-released brother!! De-clawing … is it what i think it is …. Humans taken away their claws ??!! If it is… it´s cruel and barbarism ! You have it completely right… Here in the U.S., it’s LEGAL to keep exotic animals as PETS. How? Why? I cannot fathom. And then, de-claw them, which causes a lifetime of pain and lameness. The U.S. is pitifully PRIMITIVE when it comes to these “laws” pertaining to exotic animals. And the size of their enclosures is nothing more than a tiny jail cell. It’s appalling. We need to address this issue — people have tried — but it’s LONG overdue. Thank goodness, though, for people such as these — those rescuing the hurt animals, the former “pets,” and returning those that can, to their natural environment!! Thank you for teling me this … I´m sad to here that it legal to do thing like de-clawing and have these exotic animals as pets !!?? I didn´t know that and i think its disgusting !!! Absolutely… I honestly can’t believe that 1) it’s legal to even own these animals, 2) to keep them in such dire conditions, and finally, 3) to perform a surgery on them that will cause them a life of constant PAIN. So much needs to be done in this country with this issue… SO much. Very interesting story but so sad. It’s amazing what the top predators have to go through. The apex predators have had to pay a high price for being on top of the food chain. As a country, we need a serious revision of our laws pertaining to exotic animals. De-clawing? Disgusting. And the size of their enclosures is nothing more than a tiny jail cell. It’s appalling. It’s long overdue. But much luck and love to those able to return to the wild… And to those still in captivity; may they be found and rescued by all the wonderful groups out there trying so very hard to make a difference!! You post the loveliest things. 🙂 Wonderful story, and beautiful pictures! She deserves all the love and luck the world has to offer…. We live in Cougar country and occasionally one of these magnificent animals is seen in our neighborhood. (I have yet to spot one.) Oregon still allows these big cats to be shot. A former intern of mine in California, Sharon Negri, went on to create the Mountain Lion Foundation. Very well said. Just shoot the biggest and baddest. So wonderful for this woman! I have to now look it up, of course — her organization! I personally believe in wildlife conservation for our Earth Future and Our Children’s Children’s the more we learn about what surrounds us the better we can protect it. Beautiful story! Some of us do care! These animals are just magnificent!! SO much luck and love to her — and to her soon-to-be-released brother, as well! They deserve all the luck the world as to offer…. A horrible story about the declawing practices. The plight and misery of animals at the hands of humans breaks my heart. We are INCREDIBLY behind-the-times. Our laws are downright PRIMITIVE. De-clawing exotic cats? And you should see the “legal” requirements for enclosures for these animals. It’s BARBARIC. I can’t believe the U.S. allows this, still. Well, it’s state-by-state. And it’s pitiful. At least in these stories, it all ended well, yes? The rescues AND the release, hoorah!! Thank goodness for all those people fighting for their safety and protection…. That’s great news for these two cats, I hope they do well and make a positive impact! These guys are incredibly fortunate, after such tough starts to life… So much luck and love to them; they deserve every bit the world has to offer!! Thanks so much for posting about this magnificent cat! Well done! Thank you!! They deserve all the luck and love in the world, having been through so much… These animals face too much in our world. But thank goodness to those humans striving valiantly to help them! The best thing that can be done to these creatures is to return them to the place they belongs. Great post. Thanks so much…. And you’re exactly right, thank goodness for all those people saving them, and working so hard to return them to their natural lands — lands we must continue to preserve and protect. Hahaha!! A BIG version, eh? FOR SURE BUT MY EROFEJ IS BIG OF HEART!!! They are such beautiful and graceful creatures. Although I wouldn’t want to meet them in a dark alley. It is so sad what humans did to them all in the name of having an exotic pet. So very true! A complete predator, through and through…. But one that should be given every chance the world has to offer — not shot on the spot, or caged and de-clawed and tortured. So much love to them ALL!! Wishing her a long, happy and fruitful life. I love panthers and truly hope that this stunning cat can help make a difference. Ditto, ditto, DITTO! She, and her species, deserve all the luck and love the world have to offer. They’ve been through so much, already. These panthers are true beauties. Here’s to wishing them success to go forth and multiply. Geez, that sounds so biblical. Hahahah! Oh believe me, I wish them that as well… They need ALL the luck and love in the world for this endeavor, as well as for their continued safety. Such magnificent, beautiful creatures. 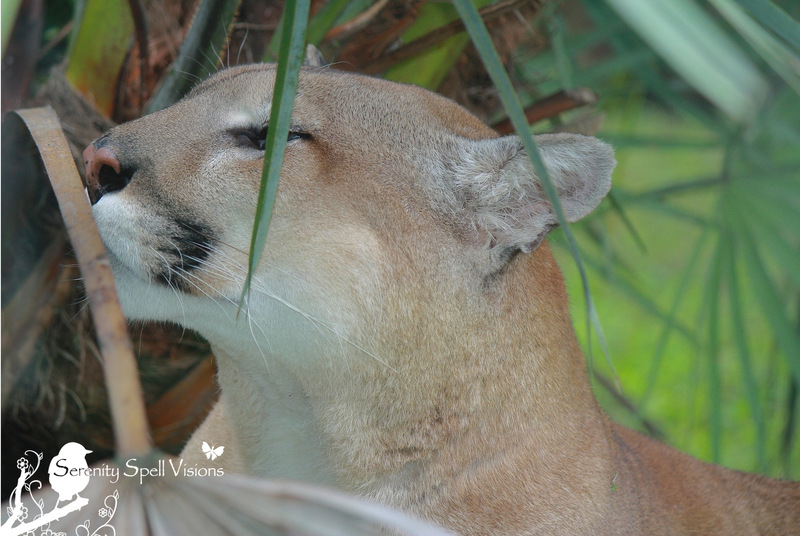 We have cougars in our city parks, but few people have seen them. The park behind the university campus has cougars. I’ve never seen track marks or any sign of them. I hope they’re safe — they must be! I’ve seen panther tracks on some of my hikes, but it’s rare. As another commenter stated — they suffer MUCH being an apex predator in our current society. It’s tragic.